In 1827 the land in the valley of Mindo are awarded to the generals who fought in the Battle of Pichincha. The Hacienda Escaleras was awarded to Marshall Antonio Jose de Sucre, who was married to the Duchess of Solanda, who lived there. The Hacienda Chinupe was awarded to General Pio Montufar, and the ’Hacienda San Vicente’ was awarded to General Vicente Aguirre in 1830. They farmed sugar cane in these lands for the production of sugar and molasses. Of Colombian nationality, he came to Ecuador in 1896 and purchased a house in Quito. He worked in the East Tropical area in Ecuador harvesting rubber, which he exported to the U.S. He married Juana Thomas, of French and Colombian descent. Before coming to Ecuador, Cesar Pompeyo worked in the construction of the Panama Canal. Once settled in Ecuador, he preferred to work in the East Tropical area, where he intended to buy land. Damian Murcia, one of his workers, suggested that he buy land in Mindo, where he was from, since these where better lands, more fertile, and with an ideal climate. Trusting his worker Damian, Cesar Pompeyo purchased the ’Hacienda San Vicente’ and other properties without seeing them first in 1902. He loved and worked the land in these properties, changing them to farms and cattle ranches, leaving a section as natural forests. The biggest difficulty he found was the absence of good roads. The Mindo river had to be crossed 14 times when traveling back to Quito, making these journeys very difficult. Since it was so difficult to bring supplies to Mindo, Cesar improved the road, such as reducing the number of crossings of the Mindo river from 14 to 4. The ’Hacienda San Vicente’ also became important to the inhabitants of Mindo; such as getting medical assistance and medicines free of charge. Son of Cesar Pompeyo, was responsible for the start of the first road to Mindo. He started in 1947, working with other land owners in the area, securing funds from the Public Works Ministry until the motor road reached halfway, (Tandayapa). The other land owners were from that area, so after that, Cesar was on his own. Cesar worked alone opening the second half of the road, using his own money and workers, since he yearned for this road to get to Mindo. Much of this preliminary work was performed by hand, therefore it took over 2 years to complete. The final motor road built years later used this preliminary road built by Cesar and his workers. 1949 - Cesar Garzon Thomas and Carlota Jaramillo are married. 1955 - Cesar and Carlota settle in Mindo, with their 3 children, at the ’Hacienda San Vicente’, which had been abandoned for 10 years, in a similar fashion to his parents 52 years before. Cesar and Carlota came to Mindo with the hope that the motor road to Mindo be completed soon. However, it took 10 long years before this happened, and their journeys to Quito took 9 hours on horseback before reaching the end of the existing motor road. From 1980 to 1990, uncontrolled tropical forest deforestation takes place in the Mindo area for 10 years before it is declared a protected forest called Mindo-Nambillo by the Government of Ecuador. Pedro Penafiel, Maria Elena Garzon Jaramillo, (daughter of Cesar and Carlota), and others, became involved in the protection of this vast (19,468 hectares) of protected forest. The Mindo-Nambillo protected forest is one of the sources that bombards the Mindo area with more than 470 birds. The protected forest has 19,468 hectares that range in altitude from 1220 to 4953 MASL (4000 to 16245 ft). Prestigious ornithologists started to come to the 200 hectare rain forest in the ‘Hacienda San Vicente’ around 1986, (before the declaration of the Mindo-Nambillo Protected Forest), to observe and study its birds, butterflies, animals, plants, etc. 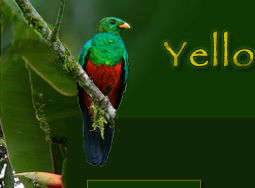 The ’Yellow House Trails’ name was first coined by a Dutch ornithologist couple, since the color of the Garzon Jaramillo family house is yellow. Today this Tropical Rain Forest paradise is a place of un-equaled beauty and natural richness. It has one of the richest variety of birds, butterflies, including ones with transparent wings, animals, plants, wild flowers, including orchids and bromelias karatas, mushrooms, beautiful rivers, etc. With its own rain forest inside its property, the ’Hacienda San Vicente’ is one of the best known birding localities in Ecuador.. with an impressive bird list of over 470 species (the highest of any locality in western Ecuador), including many threatened and near-threatened species.